PotaVida enables aid organizations to make better decisions by collecting accurate data from the field in real time and distilling it into actionable insights. To realize this, we create technical solutions that work, are simple to use, and result in dramatic benefit to people in need. PotaVida’s first product, the Smart Solar Purifier, disinfects water using just sunlight for household use in disaster relief and refugee contexts. In addition to providing safe drinking water at a dramatically lower cost, every Smart Solar Purifier records its own usage data. These data are downloaded to mobile devices to provide instantaneous feedback in the field, and are also synced to the cloud, analyzed at the program level, and sent to decision makers. Click the images below to learn more about the types of analysis we provide. 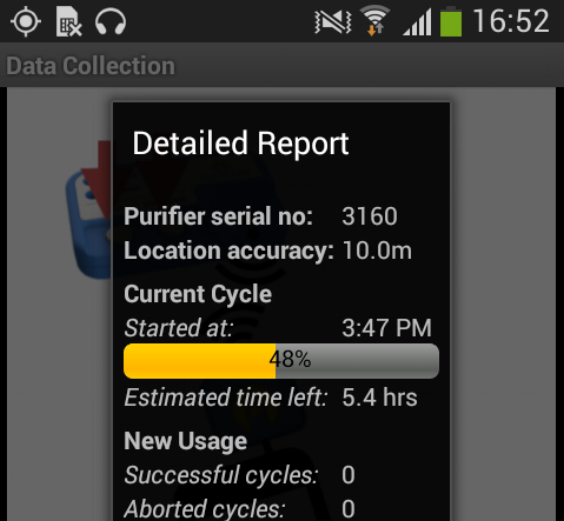 When data is downloaded from a purifier, our mobile app shows its recent usage and current status. In the daily report we provide, field staff see household usage statistics for their project area. Our daily report to staff, and their managers, also shows staff activity. We generate analyses of program-scale outcomes for upper management. We create tailored content for funders, highlighting outcomes and cost efficiency.